(Michael Calore @ Wired) I love listening to music on in-ear headphones. The sound is rich and perfectly clear, they block out external annoyances, and they’re super light and portable. As such, I frequently recommend them to friends when they ask me what kinds of earphones they should buy. But just as frequently, those friends come back and tell me they’re unsatisfied with the sound. Tinny, they say. Not enough bass. And they fall out too often. This is usually the point where we both realize it’s an issue of fit, not function. In-ear headphones look like earbuds, but they don’t work the same way. They don’t hang in the crevices of your ear-folds like a traditional bud. 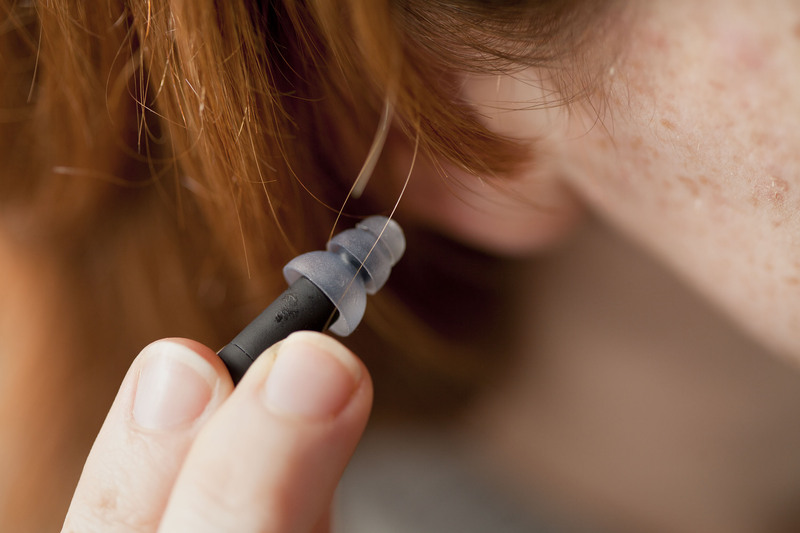 They’re meant to be worn fully inserted into your ear, so the squishy tip can form a tight seal with all of the walls of your ear canal — like a cork in a wine bottle. If you don’t get that proper seal, the transference of sound will suffer (especially the low frequencies) and too much outside noise will creep in. Start by placing the tips in your ears and pushing them in just a little bit. Then, use both hands to seal them up. For your left ear, reach up with your right hand and grab your left earlobe. Pull the lobe downwards a little to widen your ear canal. Then, use your left index finger to gently push the tip further into your ear. Don’t shove it all the way in, but far enough to where you feel the seal. Finally, let go of your earlobe. Your ear canal returns to its normal size, and you’ll feel the seal tighten. Now do the same for your other ear. You’ll notice the sound coming out of the earpieces is louder (go ahead and turn the volume down a little) and that the bass is much improved. You’ll also notice you’re pretty isolated in there. Some people don’t like this — it can feel claustrophobic. But the music is much more immersive when there’s less outside noise coming in. So learn to enjoy the solitude. Getting the perfect seal also requires finding the correct tip size. Most in-ears come with a few different sizes of tip, as well as different materials like rubbers and foams. Start with the medium size rubber tip. If that doesn’t give you a great seal, move down one size to the smaller tip and try that first. Try the largest size last — you’d be surprised, but a smaller tip sometimes gives you the more comfortable seal. If the rubber tips aren’t working, try the foam variety. There’s a company called Comply that makes excellent foam tips for all different kinds of earbuds and in-ear headphones. So if none of the tips that came in the box work for you, give Comply a shot.